This entry was posted in Award-winning columns The Rockland Jewish Reporter and tagged AJPA Karnit Goldwasser Marla Cohen Rockower Award on October 27, 2006 by Marla Cohen. This past month, Karnit Goldwasser spent her first wedding anniversary without her bashert. Her beloved wasn’t there to celebrate with his bride. No champagne, no flowers, no romantic dinner. His whereabouts are unknown; his health and safety, a mystery. Thirty-four days of war couldn’t return Udi, as her husband, Ehud, is known, to Karnit. 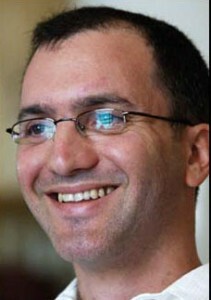 In July, Ehud, along with fellow reservist Eldad Regev were kidnapped while serving their country. The abduction triggered the war in southern Lebanon between Israel and Hezbollah. But Udi did not come home. How did Karnit mark this anniversary that wasn’t? A month before the date she asked rocker Steven Tyler of the band Aerosmith to dedicate the song “Dream On” to her husband, who loved the band. During a concert in New York, Tyler obliged, moving the young woman to tears. But Karnit, a private person, who has been thrust into the spotlight by a terrible turn of events, hasn’t said how she spent the actual anniversary on Oct. 14. Did she pray for Udi’s release? Curse her fate that she wasn’t even allowed to have a husband for a year? Or just go about the day as best she could? A pretty young woman, she looks out at the world with a brave face that is hiding the worst of her nightmares. She has told her story over and over to bring attention to Israel’s cause during the summer war and to remind us that her husband is still missing. She has told her story for United Jewish Communities as it raised funds for Israel during the crisis. She beseeched the rally at the United Nations when thousands were protesting the presence of Iran’s president Mahmoud Ahmadinejad. She tells her story every chance she gets, so that the Israeli government, the United Nations, the United States and we do not forget. Is Karnit the only one who remembers her Udi? 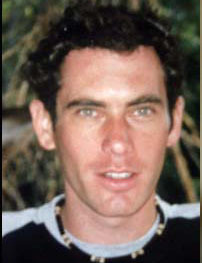 What of Eldad Regev, who was with her husband on that day and who now shares his fate? 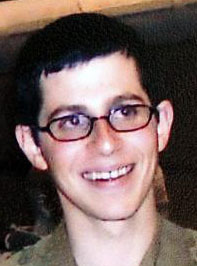 What of Gilad Shalit, the 19-year-old corporal who was captured by Palestinian militants a few weeks prior to the abduction of the other two. These days, in synagogue each Shabbat, after we say the prayer for this country, after we recite the prayer for the State of Israel, we say another prayer for the safe and return of the Ehud ben Malka, Eldad ben Tovah and Gilad ben Aviva. We ask God to remember them, so that we too, will do so. We Jews are intimately tied into the act of remembering. At our yom tovs, even people who hardly ever come to shul will show up for Yizkor, the memorial service honoring the loved ones they have lost. On Rosh Hashanah, an entire section of the liturgy is called, Zichronot, or memories. During this part of the service, we ask God to remember only the good when he judges us. And of course, we have sworn to never forget the devastation that befell us during the Shoah. What is not forgetting, but the act of remembering? And to forget? What of it? What will happen? The psalmist posits, “If I forget thee O Jerusalem, let my right hand lose her cunning, let my tongue cleave to the roof of my mouth, if I do not remember you.” To forget is to be tongue-tied, physically incapacitated, unable to fend for oneself or to do for others. But remembering doesn’t seem like enough. Praying for these three, for their speedy release, seems a little too easy from our comfortable perch here in America. And yet, even in Israel, where the population feels that the government didn’t go to the mat in the war, there are questions about what would bring them home. The United Nations Security Council resolution 1701 brought about the cease-fire that ended the war on Aug. 14. The unanimously adopted resolution ended the fighting by creating a buffer zone between the United Nations-drawn Blue Line in southern Lebanon and the Litani River, 12 miles from the Israeli border. In addition to the cease-fire and a call for a prisoner exchange between Lebanon and Israel, the resolution called for the unconditional release of the Israeli soldiers. The fighting has stopped and the cease-fire has held, but the soldiers remain captives. A recent survey, commissioned by Israel’s Channel 1, found that 68.2 percent of Israelis do not believe the government is doing enough to free Goldwasser, Regev and Shalit, who turned 20 while in captivity. More than 20,000 people rallied in Dag Hammerskjold Plaza across from the U.N. last month. Their message was clear: free them now. Speaker after speaker arose to decry the Iranian president’s presence at the U.N. and to remember that the three soldiers were not yet home. Perhaps only one speaker could understand what the families of those soldiers are experiencing. Elana Tehrani, an Iranian Jew, spoke of her son, Babak, who was arrested in 1994, at the age of 17, by the Iranian secret police when trying to flee from Iran to Pakistan. Elana has had no word of Babak since and as she spoke, she began to wail and shriek — a heart-piercing cry for her child. The memory of Babak, and the absence in her heart, was simply too painful to hear. And the truth is, outside of her family, did anyone remember Babak? A birthday in captivity, a wedding anniversary without a spouse, a missing child now maybe an adult – what can we do besides pray? Perhaps all we can do is promise not to forget.